Last year at this time prices were down 0.3 percent month-over-month and year-over-year prices were up 13.2 percent. 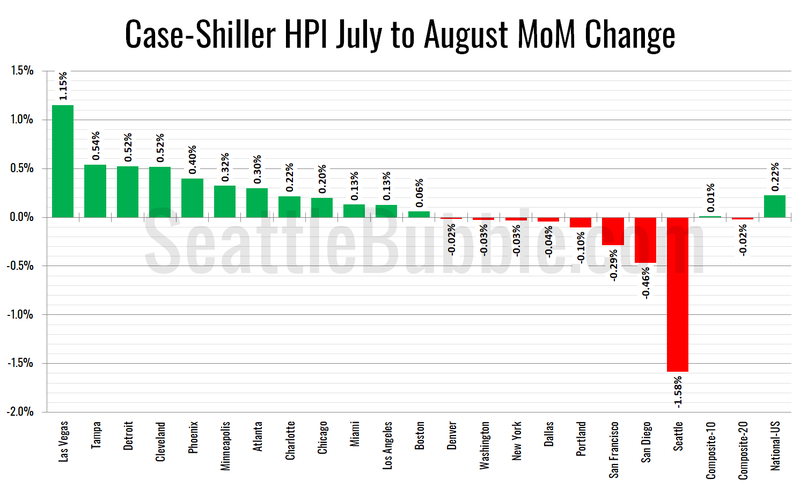 After falling to dead last in month-over-month price changes in July, Seattle continued its streak at #20 in August. This follows a four-month streak at #1 earlier in the year. Six metro areas hit new all-time highs in August (down from 11 in July): Los Angeles, Atlanta, Boston, Minneapolis, Charlotte, and Cleveland. Here’s the interactive chart of the raw HPI for all twenty metro areas through August. 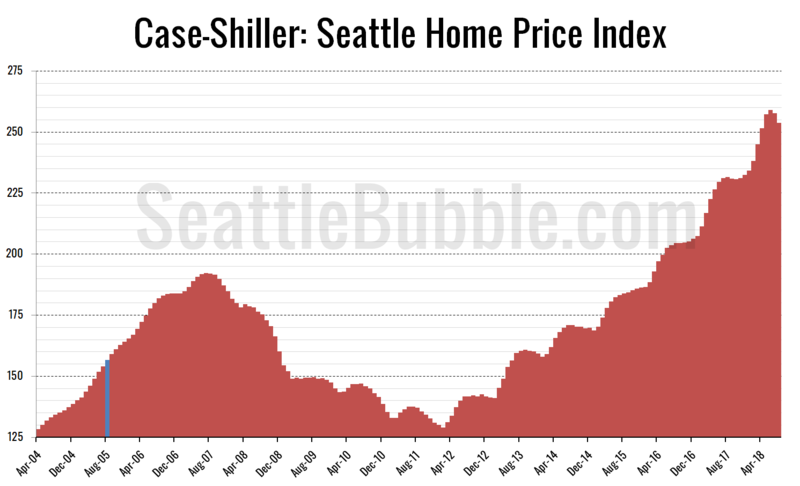 In the 133 months since the 2007 price peak in Seattle prices are up 31.9 percent. Seems like Seattle might be experiencing its own correction brought on by a rather sudden supply/demand ratio change. To me this looks like the temporary effects of Amazon hiring into a limited housing supply evaporating. Hiring has slowed and supply is catching up. Maybe Portland is a good indicator of what we would look like without the crazy highs and lows of Amazon hiring in the equation. This would suggest we have another 8% to fall, or a couple more years of flat growth before we get back on track with Portland’s median sale price growth (see delta between Seattle and Portland in the raw HPI chart above). I don’t know if I can live through another Great Recession. Hopefully we don’t have one. Trump being in control doesn’t sound very comforting. This fall, does anyone else feel like there’s less cars on the road / less people in Seattle? Nobody in their right mind is going to buy a house in Seattle in this environment. Anybody that buys this year is begging to lose hundreds of thousands of dollars, real quick like. This may be a good time to revisit some relevant historical Case-Shiller Seattle numbers. For this historical view, the momo and momo% columns are not so significant but I already had them in my spreadsheet. (**) SAWCOD/buy-by-date: Stay Above Water CutOff Date (SAWCOD). You would have to buy before this date to avoid price dropping below purchase price. I think the above is an interesting “what-if” sort of analysis. No need for anyone to get all spergy (Asperger-y) or persnickety about the assumptions, nor about the concept of a SAWCOD/buy-by-date. It is at this time just a thought experiment. SAWCOD is not a rent-versus-buy cut-off date calculation. To do such a calculation requires many more parameters and also some assumptions. Editorial note: I tired using HTML tags _code_ and _pre_, but neither one of them worked perfectly. Oh well. what if it dips more and more? be zen, be the dip! Speaking of prices and rents, Bill McBride had an interesting post today about putting prices into real terms instead of nominal terms. Evidently real prices for the CS top 20 are where they were in June 2004, and price to rent is back to February 2004 (or November 2003 depending on your source). But that’s nationally. Plenty of local markets are far beyond that point including Seattle. See the section titled “The data show no long-term uptrend in real home prices”. Some things to ask that I didn’t fully comprehend last time. 1. Who financed this stuff? 2. Where will the loses show up? Last time it never occurred to me that the large banks had financed this and were on the hook for large losses. Who is the bad company/bad bank this time? Was just on CR. Price to rents aren’t at 2008 levels but above the last few downturns. Things aren’t as bad as 2008 but what is? Real home prices are higher than they were in 1976 but lower than the last bubble. I guess it depends on what your definition of long-term is. No, it doesn’t depend on your definition of long term. The only way to improve on Shiller’s analysis would be to extend the time period. Developing a different conclusion on the long-term trend by reducing the period of analysis would be lunacy. RE: Webinator @ 2 – I enjoy the conventional wisdom that after a rocket ship explosion in prices followed by a basement shattering bust followed by another rocket ship explosion in prices, the most likely scenario is that prices will stabilize. And of course the reason that prices will stabilize is because there’s only one possible cause for a bubble to pop – sub prime mortgages – because that’s what happened last time. Whether or not we’re in a bubble now is irrelevant, because as long as banks don’t fail housing prices will never go down. Because sarcasm doesn’t communicate clearly when written, let me be clear that I believe this is laughable. The housing market, and especially the Seattle market, is linked to macroeconomics like never before. Used to be you needed to make a phone call to buy and sell stocks, and if you wanted a house you’d be driving around in the RE agent’s Lexus for several weekends, because only agents could see whats for sale, printed out on a freaking laser printer and stapled together with a Thomas Guide to find the place. Used to be that typical seattleites didn’t receive massive windfalls of cash money as part of their compensation package. The worlds moved on from that bygone era, and now the only thing keeping real property from being as completely schizophrenic as the stock market is the transaction cost in dollars. RE: BellevueTheLivable @ 14 – The subprime mortgage crisis wasn’t about subprime mortgages. In a new working paper by Wharton economists Fernando Ferreira and Joseph Gyourko, the authors argue that the idea that subprime lending triggered the crisis is misguided. The paper looks at foreclosure data from 1997 through 2012 and finds that while foreclosure activity started first in the subprime market, the foreclosure activity in the prime market quickly outnumbered the number of subprime foreclosures. …the real estate bubble was a phenomenon fueled mostly by creditworthy borrowers buying and selling homes they simply thought wouldn’t ever decrease in value. RE: MD @ 15 – except that it does have a bunch to do with subprime mortgage… MBS, CDS, and triple leverage highly inflated risk and encouraged the banks to lend to subprime credit holders because then selling these tranches securities made the banks a quick buck. That led to speculative bubble in housing that crashed because the subprime default (debt service cost higher than subprime had been approved for, but subprime credit holder has a tendency to do that if allowed..) to the bankruptcy of Lehman, which then sent shockwaves through the economy. At that point it affected a bunch of non-subprime mortgage holders who didn’t want to stay under water, so they defaulted. So yes there may have been more non subprime defaults in the end, but subprime default was a big part of issue. You can argue chick or egg whether it’s subprime or reckless banks, to me it’s more the bank’s fault as they had risk analysis but they chose profit. But you were saying that the crisis wasn’t about subprime then quote somewhere that non subprime defaults outnumbered subprime default, and that isn’t true in context. The economy is currently in solid footing as the debt to equity ratio is high, albeit lots of the equity come from real estate. But there isn’t nearly as significant risk from subprime or MBS now. Those who are perma bear and think that this will be just like 08’ wouldn’t be correct by thinking that there will be free fall in prices. I agree that this is more of a normalization rather than a crash. I bought a townhome in 2009 when no one was buying. Good, solid properties were sitting for months and we had a ton of foreclosures and short sales as a result of job loss. I had the pick of the litter at the time and when I list, I will make a good profit. Fast forward to now. We’re now pending on a SFH. Good, well taken care of properties are still moving in a week or two. We were able to maintain all contingencies, negotiate a price reduction, and get seller-paid closing costs thanks to the slowness. This is the kind of stuff that happens in a normal market. The reason inventory is so high is that there’s a ton of crap out there right now, more so than what you’d usually see in Q4. Those who speculated on crappy, expensive land or eyesores that masquerade as homes are rushing to list to try to catch the end of the surge in prices. They are finding no demand for this stuff anymore. I know of several people like us that wanted a (different) home that sat out the ridiculous bidding wars of the past few years, waiting for the market to cool off. That’s now finally happened and those folks will likely be getting off the sidelines in the next few months as spring approaches. All that said, with the rise in interest rates, I would expect further price reductions, but again, nothing like 2008. I am curious about the future looking more “normal”. Are there any historical cases where things go from a raging bull market to normal growth without some kind of crash? Not disagreeing, just genuinely would like to see some data that suggests it will flatten out after a high versus a major dip before it levels out. This is just more evidence that C/S was impacted by bidding wars, as they were impacted by distressed properties back in the day. What is a “real home price?” Our last peak was about $470k, and I don’t need to do an inflation adjustment to know we’re above that level today. The national C-S numbers might be close if you assume you need to adjust for inflation, but I’m not sure of the relevance of that to anyone. If you’re talking about the local market, I’m not sure there’s ever been a market anything like the past two years (or so). I think it’s generally accepted that the inventory levels were at historic lows, and that had consequences. But since it was an historic event I don’t think you’re going to find a historic comparison. But RE crashes are usually caused by economic events. 2008-2009 was somewhat unusual in the RE in a few large states largely caused the economic events. It’s always hard to predict NWMLS monthly sales numbers due to slow reporting (e.g. Monday and Tuesday sales not yet being reported), late reporting (Sales from September reported after the cutoff and sales from earlier than last Friday not yet reported) and also just the surge in closing that occurs at the end of the month. But it appears the sales this month will likely be down between 10-20% YOY, King County SFR. Estimate based on NWMLS sources, but not compiled, calculated or guaranteed by the NWMLS. RE: Kary L. Krismer @ 25 – It occurred to me that I shouldn’t just wing those calculations and check what between 10-20% really is rather than doing the math in my head based on a recalled number. That would be between about 1950 (1953 actually) and about 2,200 closings. That seems about right, but I think it will be closer to the lower number than the higher number, but again very difficult to predict. which to base decision on? AND…September’s YOY #s were MUCH worse that July and August were….nearly 27% fewer units sold in the Seattle area market….so this # will look even worse when updated….really don’t get Case Shiller releasing “Old” (august’s #s were available in early September..Septembers were available 4 weeks ago…odd “news”) data….they have September’s #s….and they show the bloom is off the rose….your “Heat” graph is fo real….similarly odd was the excited spin about how great that was by some of our Industry’s leaders! Going from 1st by a lot for 23 months to Last by a LOT in a few months time is NOT “Normal” Or “Balanced” but indicative of far larger issues..needs…that can be opportunities to fix our Boom or Bust Housing ecosystem….our Citizens and Communities deserve SIGNIFICANT improvements to housing policy…”sugar coating” our issues ain’t gunna fix em….admitting what the problems are and fixing them is. yes, the other people’s rent! AND…September’s YOY #s were MUCH worse that July and August were….nearly 27% fewer units sold in the Seattle area market….so this # will look even worse when updated…. 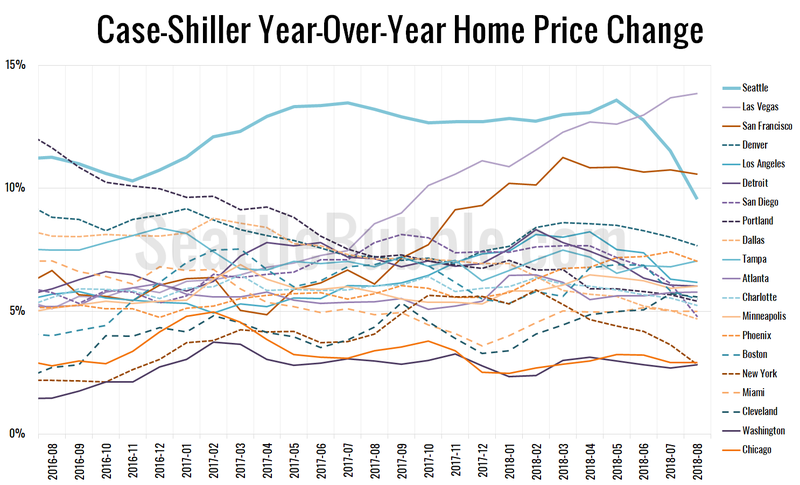 [and I] really don’t get Case Shiller releasing “Old” (august’s #s were available in early September..Septembers were available 4 weeks ago…odd “news”) data….they have September’s #s.
That C-S is stale data has been a complaint of mine for years, but my complaint goes more to it not really being newsworthy by the time they release the figures. They have good reason to take so long. First, they are dealing with national data, so a lot of data. Second, and more importantly, this is not just simple mechanical calculation, as is reporting mean and median. This is related to my post above about their being impacted by bidding wars, but what C-S does is look for paired sales and then through out anything that looks unusual, using price change and presumably other factors. So, for example, they try to throw out houses that were flipped where the value increased due to improvements made to the property. That takes time. As to going back and reporting a three month period, that’s just to get less fluctuation in their numbers. My first thought was that you can look at socioeconomic factors specific to the area to get a sense of what’s “normal” and use that analysis to extrapolate what a “normal” real estate market would look like, but I think there’s a danger of confusing what appears to be normal with what is actually desireable – that is, by the time a behavior appears to be normal, perhaps it has already become desireable. Another approach might be to define a “normal” real estate market in terms of what is most available to normal buyers, but this approach is problematic for the same reason, in the sense that current availability has perhaps already been determined by what is desirable within the market. Maybe the market can be better understood and predicted through the broader lens of the zeitgeist – in other words, look to understand the people and the time (who are we, what are the social/political circumstances, etc. ), then look at how that information can inform macro trends in decision making – what will people like this want to do in this environment? From there, it is possible to determine from what position that trend or desire can be profitable to an individual investor. Processing times should have improved by now with better technology. They do run a lot of data, but obviously no one has bothered to improve the process. There is no question we are seeing a shakeout. The real question is the scale. Certainly some people have a limited time horizon so 2008 naturally comes first to mind. My parents and their families were hammered by the Depression, so every downturn or slight recession had them thinking the next Great Depression was on the horizon. Is another 2008 on the horizon. Possible but unlikely. There are other analogues to choose from. 1981/1982– A pretty vicious downturn that really was sort of a continuation of the 1980 slowdown. I bought my first rental property during this time. 1991/1992– Sort of a typical recession. Nasty, brutish and thankfully short. I bought my first house during this one. 2015– Not really a recession, but a pause. It is even mentioned in today’s Seattle Times piece on list to sale ratio. I am not sure if there was much of an effect on prices, DOM or other indicators, but it was enough to give aid and comfort to the Permabear Chicken-Littles here on Seattle Bubble. All the builders that I know are trying to see things through the lens of 2015. Or at least that is what they say. Meanwhile, their actions tell a slightly different story. Most have stopped buying land for new projects. I personally think it will be more like 1992. It is definitely harder to sell things. But there is not really much of a price effect for the year. However, if you have to sell right, right now, you will take a bit of a beating. If we come out of this local shakeout just in time for a national recession in 2020, it will end up feeling a lot like 1980-82. Longer term I am still bullish on the area because of articles like this in the Puget Sound Business Journal yesterday. Facebook approached the city with plans for a 650,000-square-foot campus, a project detailed in emails and city records obtained by the Puget Sound Business Journal. Just as Amazon is looking to announce plans for its HQ2 the last quarter of this year, all the tech companies are turning the East Side into their own HQ2. In the short term, the real estate market is correcting. But over the longer term the overall the trend of tech consolidation and tech hiring in the Northwest continues. It is not clear when the real estate market will pick up the pace, but it will. My, my, my… wa happened? Just a flesh wound, I am sure. There’s gotta be more suckers out there, right? RE: Kary L. Krismer @ 32 – as a Data Geek I get it..somewhat..stale is stale…and this is only one month time..I agree…a longer quarter look..or longer is key…to detect trend lines…the “Heat” chart Tim published a few weeks back is telling then dontcha think? its increasing in the down….our Unit sales drop is THE most alarming one…because there is a LOT of money here…with wealthy people sitting in rentals not buying, then skewing that market too…we gots some fixin’ ta do…Condo law, GMA and Zoning-up…to fill some type and price point gaps! @ Deerhawke – Good call on bringing up prior downturns beyond 2008. I can’t help but wonder if we are witnessing a shift to more extreme ups and downs in the last 15 years brought on by the age of wall street investing in real estate, real estate viewed as a commodity more, everyday people attempting to be flippers for easy money brought on by hotel seminars, the easing of lending restrictions (In the early 90’s I believe you generally needed larger down payments, debt/income ratios etc). Back then most investors were small mom and pop landlords who bought and held for the long term. We talk about a potential crash a lot, but outside of the 2004-2007 era and 2013-2018, have we ever had a period where we saw such large run ups in prices so quickly? Interesting observation about the parallels with Wall Street. I think Tim posted some historical data on past periods of rapid growth and retrenchment. Or was that another site. I will look around and see if I can find it. This is my personal view of the time I have been following real estate. The 70’s were a dead period in real estate, especially in Seattle. The whole decade was kind of an economic convulsion. Cancellation of the SST plus two oil shocks. The post hippie period left us with no real regard for material possessions. Cheap to rent, so why buy? Especially after Volcker decided to wring inflation out of the economy and raise mortgage rates to 18%. But if you had bought during this time, real estate after the 80-82 recession was suddenly through the roof. 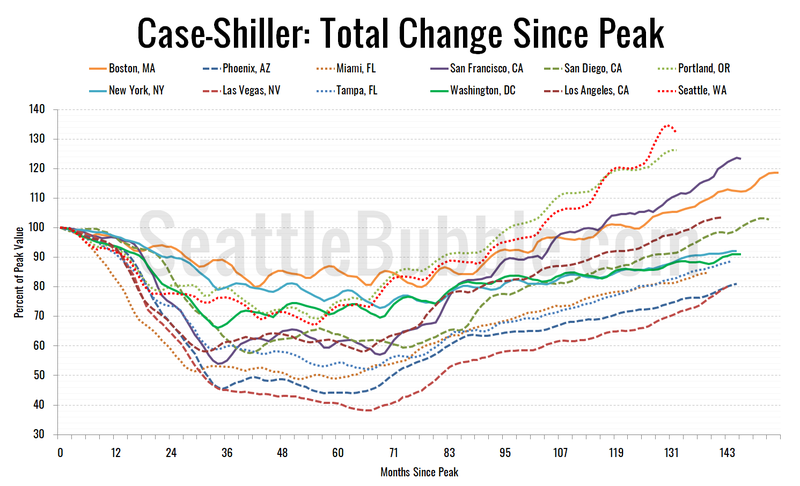 There was a tremendous runup in real estate nationwide and even more in Seattle. When my wife and I arrived in Seattle in 1990, everyone told us that we had missed our chance since everything had just doubled. In fact, older people told us that things doubled twice– first in the early 80s and again in the late 80s. This seemed plausible since we were then looking at houses in Wallingford and Greenlake in the $200k price range that had sold for $50K in the late 70s. This came to an end with the 92 recession. It didn’t last that long, but appreciation was slower but gained strength during the 90’s and up through 2007. Maybe it can’t happen again, but every recession seems to be followed by a slight pause and then things really take off again. Look at that plush leather breakfast nook! Oh my goodness! RE: Luke @ 14 – A much more famous economist said that in the long run, we are all dead. yes, i recall seeing a chart showing price trends for homes. historically, it was trending along with inflation, then in the early 2000’s it looked more like a stock market graph. i have no doubt that it’s behaving as such. So are you advocating for policy makers to intervene to reduce the cost of housing in Seattle? Or are you misinterpreting/misusing that quote? RE: Deerhawke @ 42 – I’m not sure how and why Sea RE price keeps going up without say a major plummeting or supply drop due to high labor/material cost. We will likely see higher 10 year yield that brings up mortgage interest rates, 3% wage growth and 2% inflation due to rising interest rate, much less outflow of Chinese hot money, and we have been the no 1 crane city for years. Are millennial just going to take on a heavier loan to income ratio than ever? Doubtful as well. Do we have enough double income families on the sideline itching to plunge in? I don’t know how we get those numbers to project one way or the other. Long term, I am still optimistic on Seattle RE. A short term correction is good for the healthy growth of Seattle. One thing I am worried is the mortgage rate. What if rate back to historical norm at 7%? At 4%, every dual income family have not too much difficulty to carry on. Misinterpreting and misusing, I see.. The context was a discussion of whether and how the government should intervene in the business cycle with monetary policies that could accelerate or decelerate economic expansion. He was most certainly not providing a commentary on the significance of or value in analyzing long-term trends. RE: Luke @ 54 – It’s the point of the idea that is important, not the context of the original message. People have different ideas of what is short term and long term, but if the term is long enough we’re all dead. RE: BacktoBasics @ 52 – We are a long way from 7% I think. The Fed will raise short term rate very gradually a few more times between now and mid next year, then it’s up to the 10 Year yield to respond. The yield curve has been flattening for the past two years, given the headwinds it won’t steepen until next recession hits, at which point Feds will reduce short term rate anyway. So from the mortgage rate point of view we won’t be that worse off. If you recently did house remodeling or plan doing so, you would be amazed how expensive the the labor cost is. Construction boom cause labor shortage. The only price could loose is the land. Do we have a lot developable land in the region. Not a lot on with flat surface. develop on a hilly area is very expeisive (another labor intensive work). Seattle is not Dallas. So I do see house appreciation according to wage increase and lot cost. Ho, ho. Keynes is applying a general rule to a specific situation. His direct point was to contradict the value argument that a monetary tool under consideration would fail in the long term because people would eventually adapt…. even if that adaptation eventually occurs – because time matters. His argument here is explicitly to call out the weakness of rigidly using the long term in economic matters of urgency. That is the context, and he could not have stated this more plainly. If someone were to say to you, “don’t be so obtuse” within the framework of a conversation about, say, Keynes; it would not mean that a Keynes conversation is a contextual prerequisite. It is a transferable, general statement which I am thinking you should hear more often.